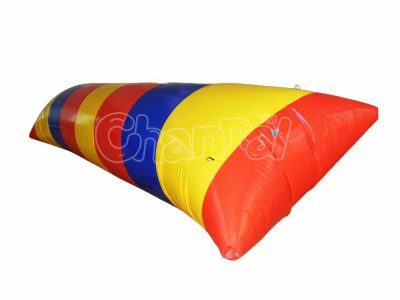 Inflatable water blob is a giant airbag floating on water, one person sits on the side closes to water and waits to be bounced into air by other people (normally two) jump on the other side of the blob toy, then falls into water with free fall or free style stunts. It’s just like a water catapult or launcher, only this case, the cannonballs are human themselves. Because of the nature of this game, which is obviously different from water trampoline, blob jumping is a great group activity for a bunch of people to have fun in summer. The best places for playing with inflatable blobs are lakes and rivers, make sure the water is deep enough in case of hitting submerged bottom or rocks. Stay safe. 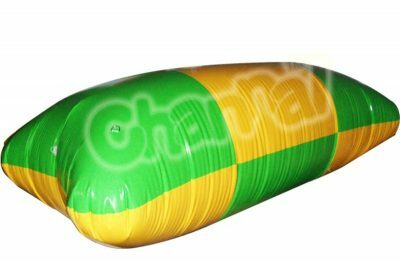 Channal Inflatables is a professional inflatable water blob manufacturer in China. We can help you manufacture your custom high quality blob launch toy, and you can buy them at a fairly reasonable price.